I am a web designer, web developer, writer & mama to 3 delicious kids, currently living in inner city Brisbane. I discovered the Brisbane City Council's "Chairs2Share" program when walking through the Brisbane City Botanic Gardens recently. My friend and I found a large grassy area, where a couple of dozen deck chairs were scattered across the lawn. People in office attire were enjoying their lunch break in the shade of a large fig tree. With their lunch in hand, they were also taking advantage of free BCC WIFI with their iPads or iPhones whilst enjoying a comfy seat. Walking further around The City Gardens we discovered more City workers on their lunch breaks sitting around enjoying the great outdoors. Chairs2Share is a program designed to enhance the way people enjoy the city's green spaces. 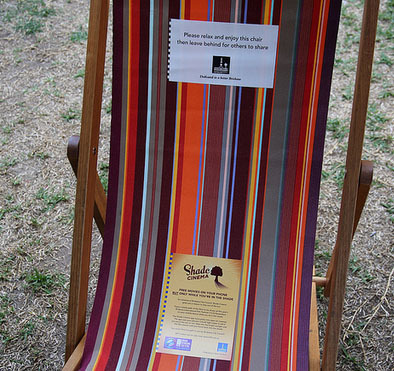 Chairs2Share makes deck chairs available for free to allow visitors, residents and workers to appreciate Brisbane's enviable outdoor lifestyle. I am ashamed to say that I didn't know that Chairs2Share has been running since mid 2013. 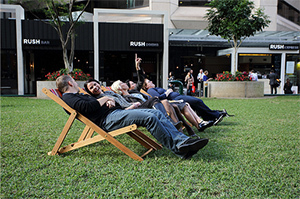 Last year, the Brisbane City Council trialled the free deck chair sharing scheme in three CBD parks, after seeing a similar project in New York. The scheme was launched in Post Office Square in June last year, before being expanded to the City Botanic Gardens and Roma Street Parklands in late September. The chairs have a usage of 92 per cent, which shows huge popularity and has proven to be a great success for the Council, especially when you consider that the initial outlay of chairs was around $14,000. 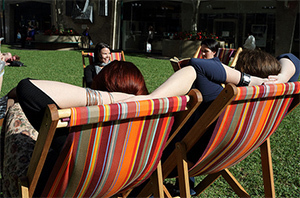 Such a simple and cost effective idea to enrich the lives of office workers and people visiting Brisbane City. 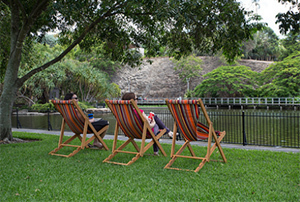 Chairs2Share is available in both the Roma Street Parkland and City Botanic Gardens. As I mentioned above, people using the chairs can also take advantage of Council's free Wi-Fi in the City Botanic Gardens.